For when you or your guests never have enough hands at parties, weddings and bbq's! 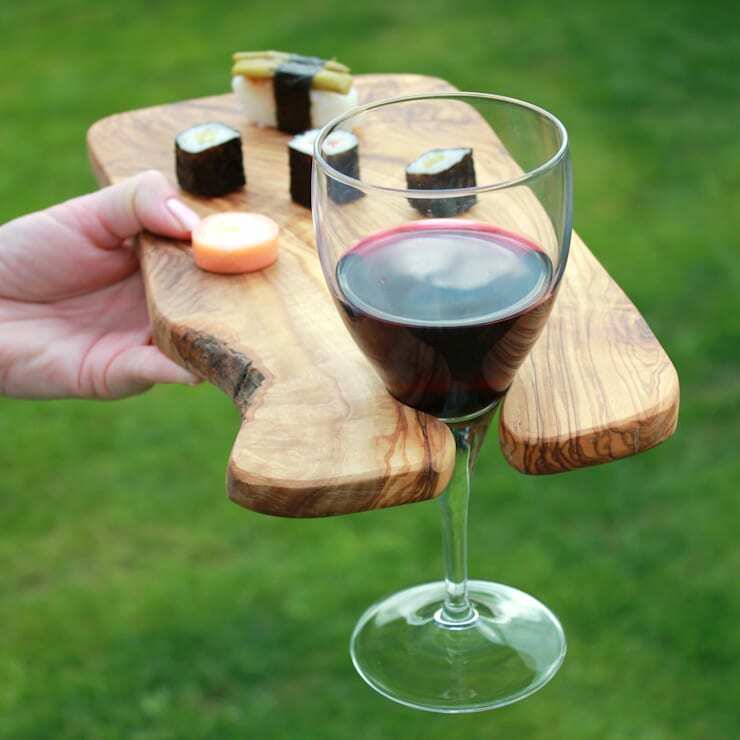 This unique artisan board has been designed in-house and addresses the age old issue of what to do with your wine/champagne glass and food plate when more canapés and food start making the rounds. Carved, by hand, from just one piece of beautiful olive wood. No glue. No chemicals. No strips of wood stuck together. Just natural. Olive wood is one of the worlds hardest wood which will last you for years… and will only get better with age. Each piece is completely unique with stunning grain patterning and a lovely natural satin feel on the flat surfaces. Average size: Length 30cm x Min Width 14cm x Depth 1.75cm. We only ever take wood from very old olive trees that have come to the end of their natural fruiting life cycle and have already been replaced with new, younger, more productive trees.